In the first Terminator Film a Cyborg Arnold Schwarzenegger is sent back through time to kill the Sarah Connor The mother of John Connor leader of the resistance before he is born. In the second Arnold Schwarzenegger’s Cyborg Character is Reprogrammed & sent back by john Connor to protect his younger Himself from another advanced terminator the T-1000. This terminator is constructed from a living metal which allows it to change shape & colour at will. It can impersonate anyone it encounters as well as form stabbing weapons. Metalloid is inspired by the idea of Morphing / Living Metal. It utilises six Liquid Metal (graphics) to display the digits required in the following Modes: Alarm, Date, Time or Stopwatch Modes. As each digit starts as Oval Droplet: Zero this melts & changes shape to display the numbers 1-9. 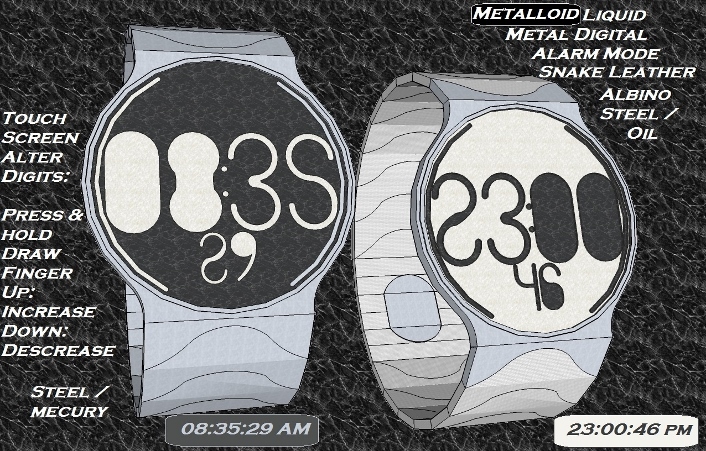 This watch has a touch screen interface that allows the wearer to change the mode with a swipe of a finger & alter the setting of each mode with ease: See Diagrams. 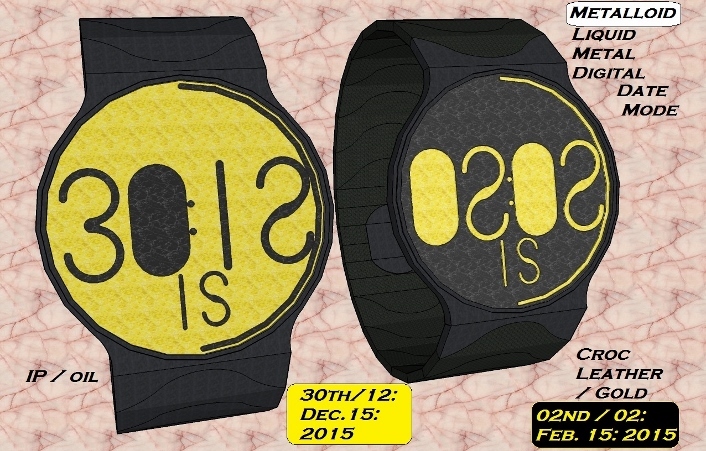 This watch design is both minimal & futuristic in its execution. 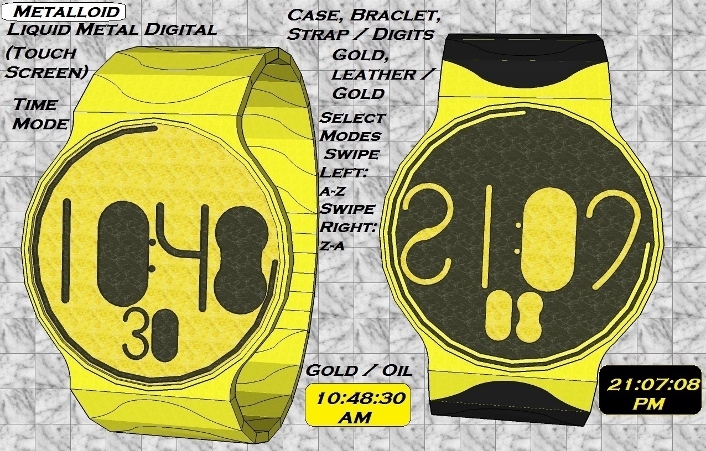 This entry was posted in Design Submissions and tagged alien, Concept Watch Design, digital, E-Paper, easy watch, futuristic, LCD Watch, sci-fi watch, Touch Screen Watch, unisex, Watch Design Submission. Bookmark the permalink. Metalloid: has three Liquid Digits & Liquid back ground Formats: (Format: Digits / Back Ground). Positive: Oil / Metal, Negative: Metal / Oil & Automatic: that switches from Negative to Positive at the stoke of Midday: PM & back again at the stoke of Midnight: AM. Metalloid: has three Liquid Digits / Liquid back ground Formats: (Format: Digits: Material, Colour / Back Ground: Material, Colour). Positive: Oil / Metal, Negative: Metal / Oil & Automatic: that switches from Negative format to Positive Format at the stroke of Midday: PM & back again at the stroke of Midnight: AM Automatically. The Format can be changed in setting mode: Press & Hold. Then user swiping their finger upward at the Top of the Screen to Select Negative Format or Downward To select Positive Format. 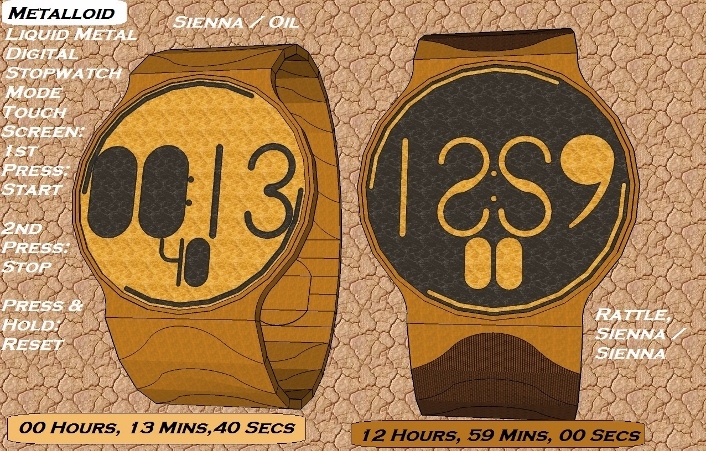 Automatic Format (Central) is selected by default when the watch is initially set-up. This is selected by the user by swiping Down From Negative Format or Up from Positive Format.